Moving into our Turn-Key home clearly would not have happened without the persistence and desire to have a home and a place that not only my husband and my daughter, and now a dog, could call a home. I think any place can really be a house. But, the way this house was built – it was made perfectly for us. If I had a checklist for all the things I wanted, MHO got it just right. Our journey – my daughter, my husband and I –all started when we moved to Asheville from New York City. We wanted to buy a house because we thought it would be affordable. We went to the bank and they let us know we would not qualify for a traditional loan. She mentioned that there was something called Mountain Housing Opportunities and they would be able to help us with a down payment. 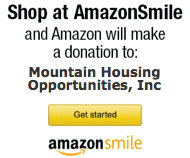 I got online and looked up things that could help us and Mountain Housing Opportunities popped up again. I filled out the application Sunday night and I heard back on Monday. I just knew it was the right thing for us. Mountain Housing Opportunities helped and held our hands through the entire thing. The reason the Turn-Key program is such a good fit for our family was because the idea of getting into some sort of fixer upper was just something that wasn’t going to work for our family. Not only were we in a situation where we needed assistance to get into a home, we had no idea how we were going to fix a home. The Turn-Key program was perfect because it was stress free. We were going to be able to move in and not have to worry about having to come up with funds in order to fix a home. One of the best parts of the house is that when my daughter lays down and she looks out of her window, she has the most beautiful mountain view. And that type of ownership – we would have never been able to accomplish without Mountain Housing Opportunities.